Ambassadors of Folk: Connecticut Master Traditional Artists showcased the artistry of Connecticut folk and traditional artists who have achieved recognition on a national or international scale. The exhibit brings to wider attention the mastery of local artists who are highly respected exemplars of ethnic traditions within their communities. The eight visual artists and two performers featured represent a wide variety of artistic genres and ethnicities and share a high degree of technical skill and sophistication. The artists’ accomplishments represent entire lives spent serving their communities through cultural production.The exhibit was on display at the Institute for Community Research in hartford in 2010. 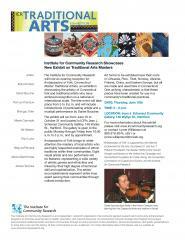 Ambassadors of Folk: Connecticut Master Traditional Artists showcased the artistry of Connecticut folk and traditional artists who have achieved recognition on a national or international scale. The exhibit brought to wider attention the mastery of local artists who are highly respected exemplars of ethnic traditions within their communities. The eight visual artists and two performers featured represent a wide variety of artistic genres and ethnicities and share a high degree of technical skill and sophistication. The artists’ accomplishments represent entire lives spent serving their communities through cultural production. Artists included Aldona Saimininkas, East Hartford; Romulo Chanduvi, East Hartford; Jampa Tsondue, Old Saybrook; Eldrid Arntzen, Watertown; Paul Luniw, Terryville; Valentine and Aili Galasyn, Canterbury; Shengzhu Chen Bernardin, Torrington; Marek Czarnecki, Meriden; Negrura Peruana, East Hartford; and Daniel Boucher, Bristol. Art forms exhibited have their roots in Lithuania, Peru, Tibet, Norway, Ukraine, Finland, China, and Eastern Europe, but all were made and used in Connecticut and beyond. One unifying characteristic is that these pieces have been created for use in a community’s traditional practices. For example, the Buddhist thangka paintings and the Byzantine Christian icons encourage active veneration, they serve a purpose beyond being paintings to be viewed. Other forms on display included decorative containers, cloth, commemorative pictures and rugs, wood carvings, and important seasonal decorations such as two types of dyed and etched Easter eggs. All of the art forms are beloved in the artists’ communities in Connecticut, where they serve as important expressions of cultural identity and heritage. This exhibit celebrated the twenty years that the Connecticut Cultural Heritage Arts Program - based at the Institute for Community Research from 1991-2015 - has worked with these and other remarkable traditional artists and their communities across our state. Ambassadors of Folk was supported by the National Endowment for the Arts, the Edward C. And Ann T. Roberts Foundation, the Greater Hartford Arts Council, the CT Commission on Culture and Tourism, and the Institute for Community Research.